Probably the number one piece of advice you will hear from 'experienced' parents of twins is get help - as much as you can for everything. In the first few months you will hit levels of sleep deprivation that makes dead and finals week in college seem like kid stuff. Friends and family can be a great resource for help. 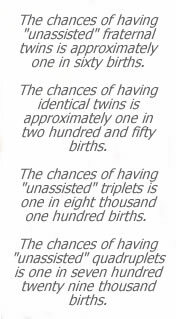 However, twins and twin pregnancies are completely new and different than a singleton pregnancy experience, you should find folks who have "been there, done that". Staying active in the twin clubs and multiple clubs by taking advantage of their play dates, socials, Moms Night Outs and other activities after your babies are born can be a great way to maintain your sanity as well. Most Twins Clubs do not charge a membership fee until you have your twins - attending meetings with these Mom's who have experienced what you're about to is an unbelievable asset! If you can't find a Twin Club or a Multiple Club in your area via web searches, visit one of the National Association pages, check with your pediatrician, or ask other twin moms in your area. Twins and parents of twins, triplets, and quads, seem to be drawn towards each other - it's amazing how many times we've gone to dinner, the bank, the post office, only to discover that the people next to us have twins of their own! NOMOTC is a network of over 475 local clubs representing 23,000 individual members. NOMOTC isn't just for Twins, but Triplets, Quads and other multiples! If you can't find a local Twin Club in your area, they will assist you in starting your own club. Twins Magazine has a directory of national an international Twins Clubs and Multiples Clubs. We found that our own local information was not current, but this might be a good place to check if you are unable to find a club under the NOMOTC directory.